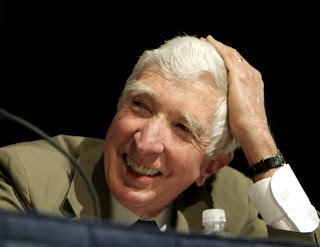 As a tribute to John Updike who died yesterday at the age of 76, I am reprinting this blog post from the fall of 2008, in which Updike comments on the election for the New York Times. Also as a more personal tribute, I am reading one of his first collections of short stories, Trust Me, which is over 30 years old, and truly stands up to the test of time, and highlights what Updike does best - capturing certain "truths" in life and relationships, and seeing the literary, or magic, in what others might view as mundane. Updike's magic makes us think twice about everything we do - flying on a plane, checking into a hotel, going through our old stuff in the attic, going on a date, sitting at the dinner table with your spouse. He is truly a writer's writer, and will be greatly missed. How would Rabbit Angstrom vote? In honor of the election, I thought I would take a literary moment by highlighting this interesting video from the New York Times, in which Updike comments on the current election. Updike, famous for his highly eloquent prose and for being the ultimate chronicler of "suburban adultery," has won the Pulitzer Prize for literature and is most well-known for his "Rabbit" series - Rabbit, Run; Rabbit Redux; Rabbit Is Rich; Rabbit At Rest; and Rabbit Remembered. The Witches of Eastwick (1984, later made into a movie of the same name) concerned a New England coven of divorcees, and was a bestseller; The Coup (novel) (1978, about a fictional Cold War-era African dictatorship), was similarly a bestseller, and reflects the author writing at his most Nabokovian; his 2000 postmodern effort Gertrude and Claudius is a carefully researched overture to the story of Hamlet. Other important novels include The Centaur (National Book Award, 1963), Couples (1968) and Roger's Version (1986). (Martin Amis called Roger's Version a "near-masterpiece"; Couples both landed the author on the cover of TIME magazine and made his fortune.) Updike most recently published "The Widows of Eastwick," a sequel to the Witches work. Obama, he states in the video, strikes me as someone of extreme compassion. He is also curious about how other people think. Anything can happen in this election. There is a streak of naivete that runs across the country. Rabbit Angstrom would have been interested in the heroic side of McCain. He was fascinated by that kind of thing.